Glenn Whelan pictured at today's press conference. 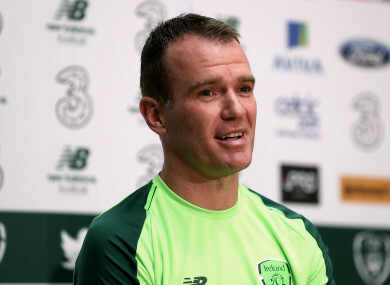 GLENN WHELAN MADE a rare media appearance today, as the Ireland midfielder prepares for the end of his international career. The 34-year-old Aston Villa player will earn his 85th cap against Northern Ireland. While saying he would always be available for the national team if needed, he acknowledged Thursday’s game was likely to be his last in a green jersey. Whelan has generally tended to avoid speaking in front of the media in recent years, but was asked by Martin O’Neill to attend today’s press conference as he prepares to lead out the Irish team tomorrow. And the Irish manager was among those to pay tribute to the Dubliner. “During my time, I thought that despite the fact that he is seemingly a pretty quiet lad in many aspects, I thought he led the team, he was captain of the side under me and had a really good time before that under Giovanni,” O’Neill said. Whelan, meanwhile, admits he will miss the thrill of lining out for his country on the international stage. “Every time I’ve come in, I’ve tried to make the most of it,” he says. “Not being here for the last 12 months, you miss your time with the lads. I’ve loved every time I’ve played and [am] really appreciative of being able to come in for the game on Thursday. The player’s family are set to attend the game amid what is likely to be an emotional occasion, a little over 10 years on from making his senior international debut under Giovanni Trapattoni against Serbia. The former Stoke player was also quick to emphasise that he had not definitively retired from international football. “I never picked to come and play for Ireland. I’ll never pick when I don’t want to play. He knows if anything happens, I will be available. I’ve done my coaching badges, but see myself as playing for as long as I can. “Obviously the manager over the last 12 months or so has tried to bed new lads in and that’s the way Ireland are going. I’m more than happy with that — these lads have waited a long time and they need to get some caps under their belt. But for me, looking at the next couple of years, hopefully we do qualify. But I’d be 36 or 37, so I think that’s way off. Retirement, as in putting it down on paper, I’d never do that. For years, Whelan was a mainstay of the Irish team under Giovanni Trapattoni and Martin O’Neill, with his performances helping the Boys in Green qualify for two major tournaments in the process. More recently, however, the veteran star has been out of the team, with younger players coming through, and Whelan understands why O’Neill has opted to leave him out more often than not in this period. “It’s been difficult. The results haven’t been right, but you can see with the players who have come in, there are lads with a lot of experience who have dropped out. It takes a bit of time. O’Neill added that the team had missed Whelan’s influence in recent matches and felt the player has been underappreciated in certain quarters during his career with the Boys in Green. “He goes about his job in a manner, not the most demonstrative way, but the thing I’ve liked about him is that he’s never shirked the responsibility when things aren’t going so well. Email “'The phone hasn't stopped. There are people coming from everywhere. My little lad is going to be mascot'”. Feedback on “'The phone hasn't stopped. There are people coming from everywhere. My little lad is going to be mascot'”.